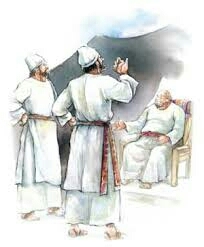 At this particular time in Israel’s history, blind old Eli was the high priest. He and his two sons, Hophni and Phinehas who served with him, were part of a corrupted priesthood. They were no longer counted worthy by God to have the Ark in their possession. The word, “Taken” is in quotations because it was more like the Ark took them captive! What they thought was merely a golden box, that “Box” housed the Most High God Who can most certainly defend Himself! 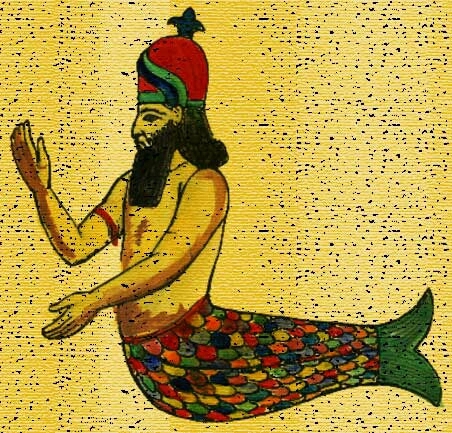 Well, they placed the Ark in the temple of their “god,” Dagon the merman—he was half man, half fish—rejoicing that he gave them the victory over the God of Israel. But the next morning, where was their “god?” FACE DOWN IN FRONT OF THE ARK, bowing down before it! The priests of Dagon thought maybe there had been an earthquake or something during the night, so they helped their “god” back up (snicker). Next morning, where was he again? Same posture: Face down again. Hmmm…..very strange! Was there another convenient “Earthquake?” So they helped their “god” back up on his place again. And guess what? 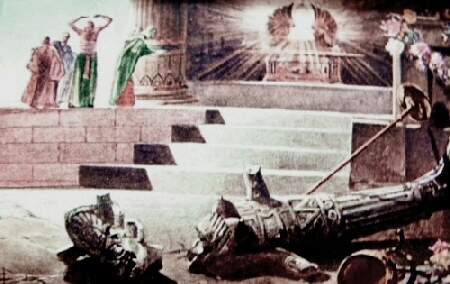 The next morning, Dagon was once again on his face before the ark except that this time, HIS HEAD AND HANDS WERE CHOPPED OFF! Head speaks of intelligence; hands speak of power, the arm of flesh, and human striving. At Calvary, that’s what happened to the devil: His power and intelligence were destroyed, his HEAD CRUSHED! Hallelujah! Everything in the Old Testament points to something in the New. Remember when the soldiers came to take Jesus “Captive” in the garden? They asked Him if He was Jesus and He said He was. Literally, the words he used were, “I AM.” Every single one of the 1,000 big, tough, burly, armed soldiers fell to the ground before Him! You see, He cannot be taken captive, either. I have no doubt that He allowed the to get back up. He patiently waited until they got up, composed themselves, dusted off the dirt. 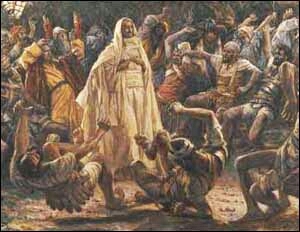 He very likely held out His hands for them to restrain, allowing Himself to be taken and crucified. He willingly giving up His life to save all of us! Lucifer used to be the Cherub who covered. He was basically head of the choir of heaven. But he wanted to be God. Well, that wasn’t happening! So he, and 1/3 of the angels that sided with him, were tossed out of heaven. Ever since, he has been trying to achieve that objective. But if he had an inkling of a clue that crucifying Jesus would lead to his head being crushed, I guarantee you, he would never have “orchestrated” Jesus’ capture and death. In so doing, he brought about his own demise and sealed his fate FOREVER! He was completely clueless! The modern-day counterpart of the Biblical Philistines, are just as impotent and their forebears. 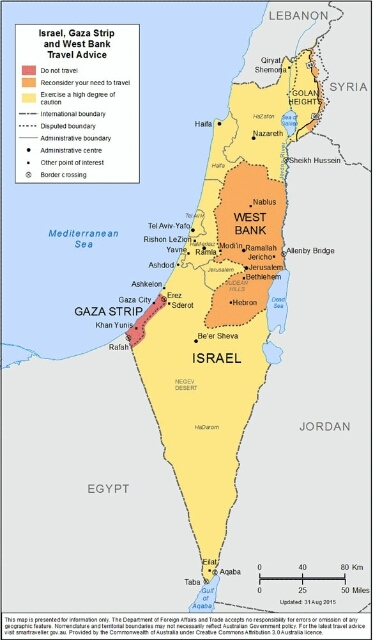 They live in the area we know today as the Gaza Strip. They have the same agenda, the same murderous intentions, and the same hatred for the people of Israel. Just like their ancient counterparts, they can NEVER PREVAIL AGAINST THE GOD OF ISRAEL! That goes for any other nation that seeks to harm the apple of God’s eye. As it says in Psalm 124:4, “He that keepeth Israel NEITHER SLUMBERS NOR SLEEPS. Oh yes: Our God is FAR greater than the “god” of the Philistines!